Editor's Note: Very often, I think much of the personal history that used to consume much of blogging is being lost with less personal updates on companies and trends. I am hoping to launch and sustain a regular series called "Real Valley Stories" that discusses my own experiences with work, social and business. This is the first. Your feedback is absolutely appreciated. A senior at UC Berkeley finishing up my double major in Political Science and Mass Communications (Journalism), I had left the student newspaper for more lucrative greener pastures, not having yet completed my degree. At the time, I didn't know what direction my career would take - though I had some good ideas. I made two versions of the resume, one for being a reporter, which I sent to newsrooms in the Bay Area, and the second, for being a Webmaster of sorts. It being 1998, with the dotcom boom accelerating, that's what gained traction. Soon after I started looking, I landed an interview in Burlingame with a company I had never heard of: Internet Valley (http://netvalley.com/). Being a poor college student, I didn't have a car, so I took to the Web and found the best route was to take BART from Berkeley to San Francisco and catch a CalTrain to Burlingame. From there, I figured I would find the address on foot. If I got the job, maybe I could afford the car later, I thought. 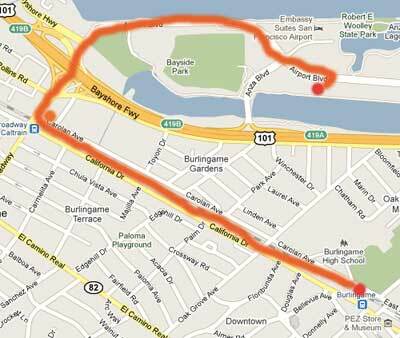 My Walk from the Burlingame Caltrain Past Broadway to 577 Airport Blvd. With the appointment at 4, I took the BART at 1:25 from Berkeley, got to SF around 2, and by 2:30 was on my way to the Burlingame train station. Around 3 pm, I exited, and asked the first passerby I could find where I should go. His ominous answer, "Are you walking or driving?" foretold what would come next. I was to walk up California street, turn on Broadway, walk over Highway 101, turn right and make my way to the building. As I walked and walked, I found myself passing the Broadway Caltrain station, and briskly walk/jogged over the route I had been prescribed. It soon was 3:55, and I found the building, at this point, panting, sweaty and no doubt dusty from my excursion. Once I entered the building, I looked for Internet Valley and found nothing. But in suite 180, where I was headed, a nondescript door said "Technology Projects". I entered, and found an empty lobby and empty desk. I went further and found two people talking to one another - in Russian. This is who I was to meet. The interviewer scarcely remembered my resume, so I recapped my work at the student paper, told him of my studies, and explained the process of getting the paper created and online. He seemed impressed with the paper's design, the fact I did it five days a week, and my story of installing a custom search engine with arcane Unix commands through a terminal. But it turned out my design background wasn't to be necessary. In what in some ways proved to be prophetic, I was told that people in the future would not read full stories online, as they did in print, but that they would skim and scroll, with their attention being caught by bold text and big headlines. The site was ugly. He joked about e-mails he received saying the site looked like it was designed by a 12 year old. But some of what he said had merit. And interestingly, it was my youth and inexperience which attracted me as a candidate to him - with others being set in their ways and preferences. After we had figured each other out came a new step I hadn't thought much about, and my not being prepared negatively impacted my income for years to come. We had to discuss how many days and hours I could work in Burlingame, and how much I would be paid. But I had no clue. I tried to tease out of him a first figure, but he wouldn't blink. I asked about funding, profitability, investors, and stock options, but it all wasn't very clear. The idea was to put together a working product, find secondary investors, and then go public. Everybody went public. He threw words at me like "stock holdings", "venture capital" and IPO and said I was getting in on the "ground floor", the next level beyond being a cofounder. We could "Go Netscape", he said. As I hadn't graduated from college yet, and was still at Berkeley, we settled on 20 hours a week in Burlingame and 15 or so at home. But when it came to cash, the only benchmark I had was that the editor in chief at our school paper had made $800 a month, and all I wanted to do was to make more than that. I spat out something stupid like $1,000 a month, not doing the math until later to realize how stupid that was, especially with commuting factored in. Nothing was signed, and I was told they would get back to me. At one point, they asked "how did you get here?" and when I told them about not having a car, I didn't let on that I got off on the wrong station. Didn't want to sound too dumb, after all. "I felt confident about the meeting with both the editor/publisher and the boss, and the company's intent -- to promote the history of Silicon Valley and its companies and media all in one area -- is admirable and something I would be interested in. Even if I were hired and the place went belly-up, it would be good to have on a resume, especially learning all that Windows NT crap. I find out in two days." Two days later, walking home from school, I got a buzz on my pager - yes, a pager. I called Internet Valley, and was told that I did after all get the job, and that I would be paid more than I had asked for, a massive $1,200 a month. Better yet, I was going to receive a signing bonus, of $2,000, which I could use to buy a car. The idea that I would get a signing bonus, and that my first paycheck would come from a pot of $2,600, was amazing. I said yes, and that's how I got my first job. It's a real Valley story.